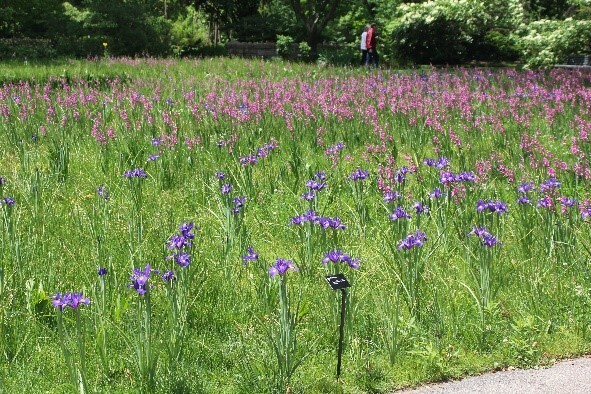 The Missouri Botanical Garden has transformed an area of turf adjacent to the Lehmann Building into a space of wonder. Hundreds of thousands of flowering bulbs carpet the lawn in a succession of bloom from late winter well into fall, starting with dwarf iris and spring crocus, and ending with fall crocus (Colchicum spp.). Turf has never been that interesting to me but this technique was so transformative, I was encouraged to try it in my jungle this fall…though to a much smaller scale. 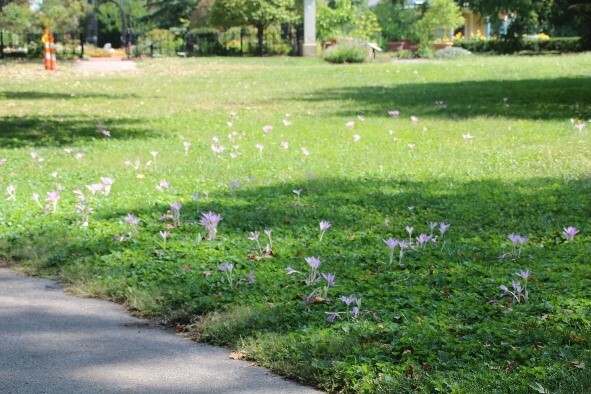 To naturalize bulbs in my selected turf area, I started with late-winter bloomers to hopefully give foliage enough time to "ripen" completely next spring before the lawn needs mowing. I borrow the word "ripen" to mean that the leaves will have enough time to sufficiently feed the bulb before being fully or partially mowed off. I randomly planted early crocus, three dwarf iris cultivars (Iris reticulata) and striped squill (Puschkinia libanotica). Some I planted in groups of various sizes (2-5) and others I planted singly to give a more naturalized appearance. If all goes well next spring, I may consider adding some winter aconite (Eranthus spp. ), glory-on-the-snow (Chionodoxa spp. ), snowdrops (Galanthus spp. ), Siberian squill (Scilla siberica) or mini daffodils like 'February Gold' next fall. 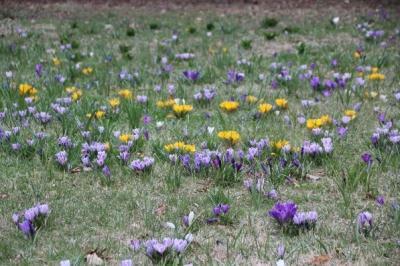 Bulbs usually come with instructions on how many should be planted per square foot for bed planting. But what if you like circles of colors rather than squares? A square foot is equivalent to 144 square inches (12" x 12"). Then calculate what the diameter of a circle whose same area is 144 square inches. Using the area of a circle formula (A=πr2), we find a circle with the interior diameter of 13.54" equals 144 square inches. You can now make a simple template out of a cardboard box regardless of whether you like squares or circles, while still maintain the proper density regardless of how big of bed you are planting! Rodents can be serious pests following bulb planting, especially to small bulbs which are not planted deeply. Just in a short period of time, scavenging rodents, most especially squirrels and chipmunks, can dig up all your hard work. 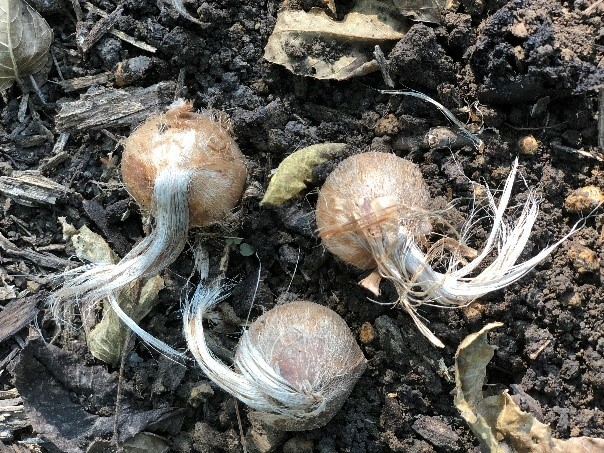 Edible bulbs either mysteriously disappear or little bits are left behind on the surface to signal their destruction, while the inedible ones are usually just left scattered on the surface. For this reason, inspect planting sites the next several days after planting to insure that any uprooted bulbs get replanted and any obviously eaten ones are noted for the next bulb order. From experience, any noticeable disturbance in the soil attracts rodents to scavenge, so effort should be made to conceal signs of digging. 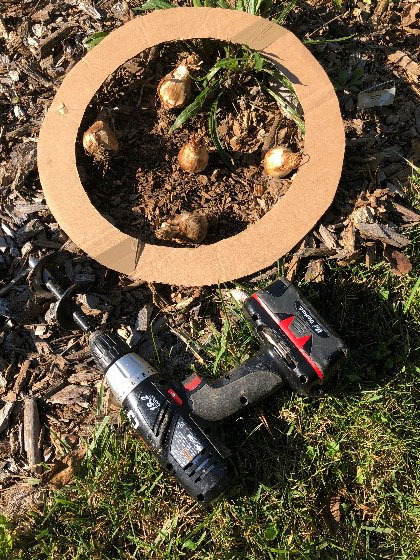 To reduce scavenging, always plant bulbs to their maximum depth using soil to firmly refill the hole rather than mulch, just to make it less attractive. Camouflage the disturbed area with leaf or bark mulch, followed by watering just enough to settle the planting area surface. In some cases, wire mesh over the planting area may be warranted until the soil settles and removed before foliage emerges in the spring. Where moles are an issue, some bulbs can be underlain with wire mesh to protect them from underground feasting. Incidentally, my dog shows the same behavior with disturbed soil. Anytime I do a poor job of camouflaging a newly planted "anything", she digs it up enthusiastically as if spying a rodent in its burrow. Out of thousands of plants, she can immediately find and harass anything newly planted. 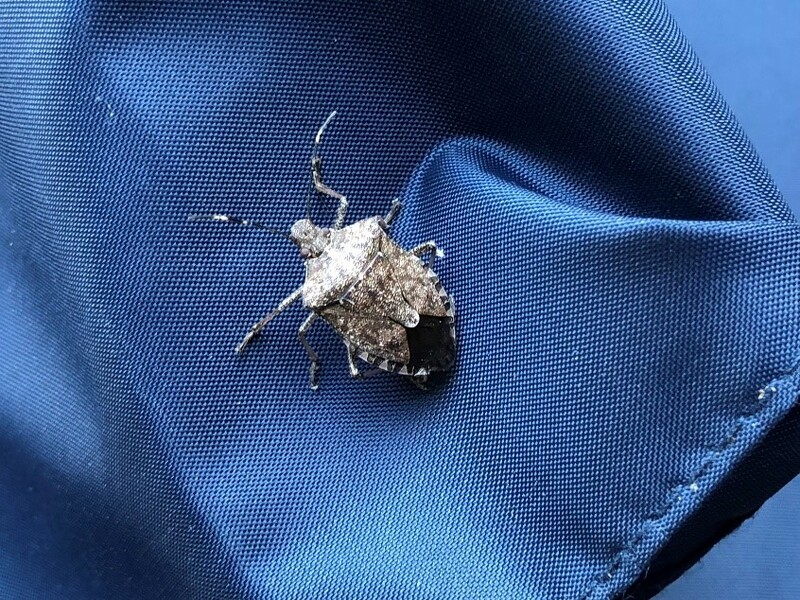 It is pretty obvious that brown marmorated stink bugs (BMSB) are now congregating and looking for winter lodgings. While I was planting bulbs the last day of September, various layers of clothing including a sweatshirt, gloves, hat and apron came on and off throughout the day. When off, they were draped over one of the patio chairs and in just a matter of moments, several BMSB found their way into the nooks and crannies and had to be shaken out before redonning. Out of curiosity, I opened the umbrella we keep on the patio for taking the dog out when it's raining, only to find it totally infested with BMSB. By the time I had removed them all, I had to go inside for a breath of fresh air. I'm pretty sure one came in with me!